The Small Business QUICK Guide to Goal Setting is a FREE 23 page PDF download written specifically to assist business owners with setting goals and establishing a clear direction for their business. It contains practical action oriented advice and is based on 2 decades of coaching small businesses to achieve their objectives. How to set effective goals. How to have a "goal focused" business. 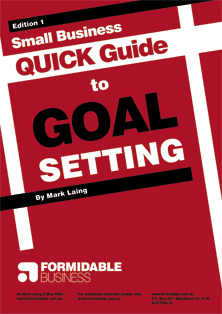 Common goal setting mistakes to avoid. Questionnaire to assess how goal focused your business is. How to set strategic objectives and a clear direction for the business. The types of marketing and operational goals to set. Implementing actions for achieving each type of goal. This comprehensive Guide includes the materials you need to set goals for the key areas of your business. No obligation - just download the PDF document. AVAILABLE NOW for FREE. To immediately download a copy of this PDF document please click here.